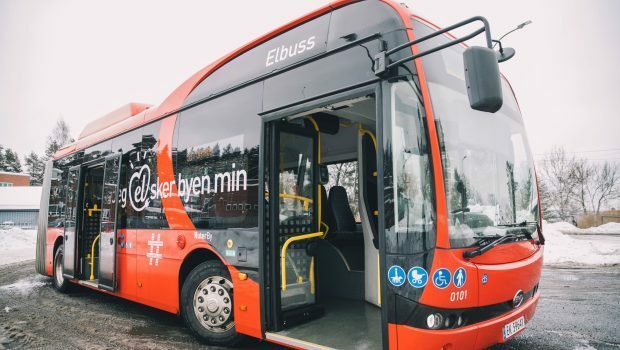 Oslo has taken delivery of Europe’s very first electric «bendy» buses. And the bus drivers won’t be the only people to benefit from the arrival of these Chinese buses. “You can see it from the serial number,” says Harald proudly, as he points at the number 01.01 on the front of the bus. Harald Nesset is operations manager at Nobina, one of the bus operators that provides services for Ruter, the public transport company for the Oslo region. He is showing us the new bendy bus that we’re about to ride on route 31 from Grorud to Snarøya. With around 50,000 passengers each day, the route is Norway’s busiest when measured by the number of passenger journeys. “The electric bus grips the road well and that’s necessary in this city. The bad roads are tough on Oslo’s bus fleet, so it’s good to drive a bus that can tolerate them to some extent,” says Harald, who adds that it’s still necessary to drive cautiously. Norway was the first country in Europe to take delivery of two electric bendy buses from Chinese bus manufacturer BYD. The buses are owned by Nobina and will be trialled on route 31 for two years. In addition, Norgesbuss has two electric buses serving route 60, and Unibuss has two electric buses on route 74. This spring, 70 new electric buses will be phased into operation. Harald presses a single button to start the bus. The familiar rumble of a bus engine is absent as the vehicle glides majestically across the terminal. 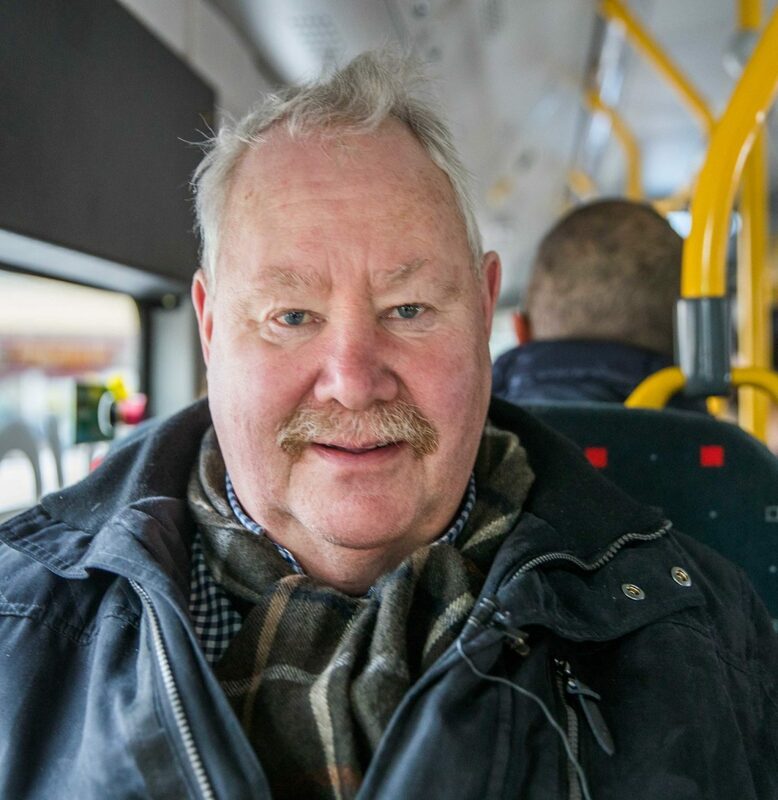 “Being a bus driver in Oslo can be a tough job, but this bus feels a little like a radio-controlled car, and driving it is obviously a much calmer experience,” says Harald. Miroslav Ducat is one of the few bus drivers so far to have got to drive a new electric bendy bus. Miroslav is very happy with how quietly the bus runs and how easy it is to operate. “On my first shift, I drove for four hours without having to charge the battery. The battery was still over 50 percent charged,” he says, before easing the 18-metre-long bus into the lay-by at Tonsenhagen bus stop and letting the first passengers on board. Our goal is to get as many people as possible to take public transport rather than travel by car. Dagfinn Movold is among the passengers who board the bus at Sinsen. He sits himself down right at the front close to Miroslav and looks around in amazement. “I saw it was an electric bus. That’s why I wanted to sit right at the front,” he says. The bus looks fairly ordinary, apart from the large white lettering on the side, which uses a Norwegian pun to advertise the fact that it is electric. Dagfinn seems to be having a splendid time. “It’s very quiet and pleasant,” he says, and adds that it is good that Ruter is taking steps to reduce pollution in the city. “It was very quiet and pleasant,” says Dagfin Movold, one of the passengers riding on an electric bendy bus for the first time. 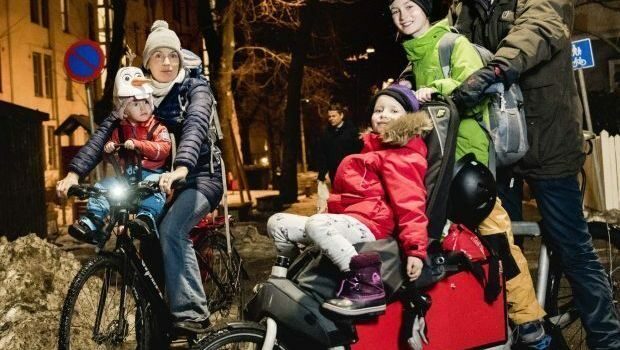 The longer-term goal is for all public transport in Oslo to be emission free by 2028, with zero-emission solutions being adopted for all ferries and Ruter’s 1,200 buses. The transport sector accounts for 65 percent of Oslo’s greenhouse gas emissions. Only four percent of these emissions come from public transport. “Although public transport is responsible for a relatively small proportion of emissions, the city will benefit from better air quality and less noise as the result of zero-emission solutions. Our goal is to get as many people as possible to take public transport rather than travel by car. 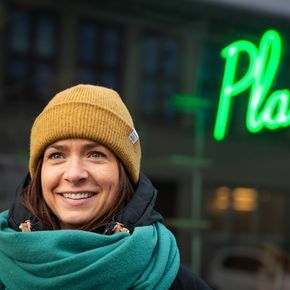 This means that an ever-increasing proportion of zero-emission public transport will make an important contribution to the achievement of Oslo’s climate goals,” says Gro Feldberg Janborg, director of communications at Ruter. Figures from Ruter show that more people used public transport than travelled by car in 2016, and this trend seems to be continuing. “With quiet, zero-emission buses, in addition to services that are better adapted to individual needs, we have confidence that people will find it attractive to use public transport rather than their own cars in more and more situations,” says Janborg. When Miroslav guides the electric bus through the inner-city streets, the ride is noticeably noisier and bumpier. This has nothing to do with engine noise. Worn-out streets with pot holes and bumps, in addition to old tram tracks, contribute to making the journey a little less refined than the ride from Grorud to Sinsen. Even so, there are several passengers who notice that the bus is electric. 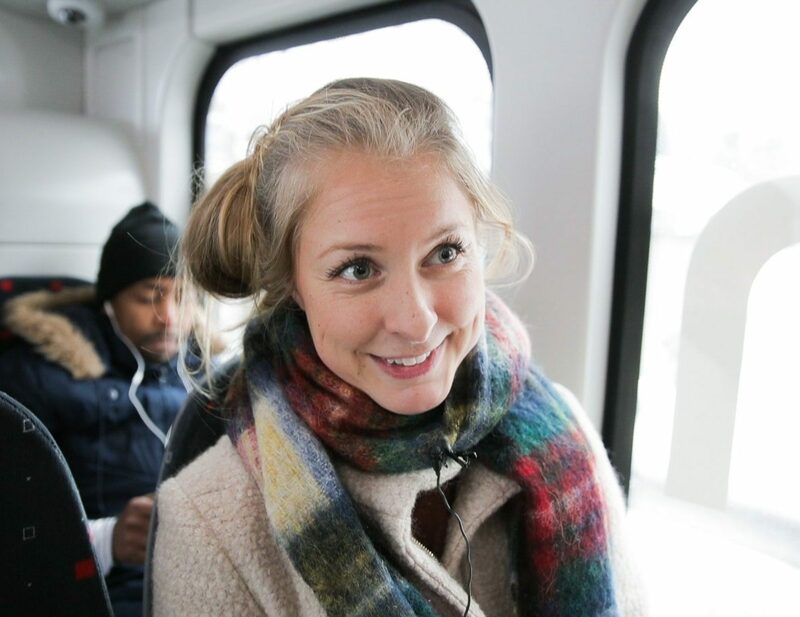 Caroline Thomassen is someone who has recently decided to take the bus to work, rather than driving. “I noticed that it looked very new and fresh, and it’s also very pleasant to travel on,” she says. Caroline Thomassen has made the decision to take the bus to work, rather than drive her car. “The electric bendy bus is very pleasant to travel on,” she says. Janborg explains that Ruter will be imposing increasingly stringent environmental requirements in its tenders, and will be clear about its goals and the measures it is taking to achieve them. “We are going to show the transport sector that it’s possible to transition from fossil-fuelled to zero-emission transport,” she says. Today, 99 percent of the world’s electric buses operate in China, but ever more operators in Norway and abroad are opting for electric buses. It remains to be seen whether the rest of the transport sector will sign up to the battle to reduce pollution. The three trials are intended to build the competence needed to transition the entire bus fleet to zero-emission vehicles. The trial period will last two years, with six electric buses serving various routes in Oslo. Unibuss is testing two electric buses on route 74, with a charging point at the bus terminal at Mortensrud. Norgesbuss is testing two electric buses on route 60, with a charging point at the bus stand at Tonsenhagen. Nobina is trialling two electric bendy buses on route 31, with a charging point at the bus depot at Jernkroken. This story was first published in Norwegian in March, 2018, and updated in February 2019.